NMI being the first to launch Automatic Exposure Detection (AED) Technology, greatly simplifying the digital transformation of analogue X-Ray systems into Digital in an easy, affordable way. All the Saturn 8000 series products, feature AED technology which can be installed with any generator without physical synchronization between generator and detector. 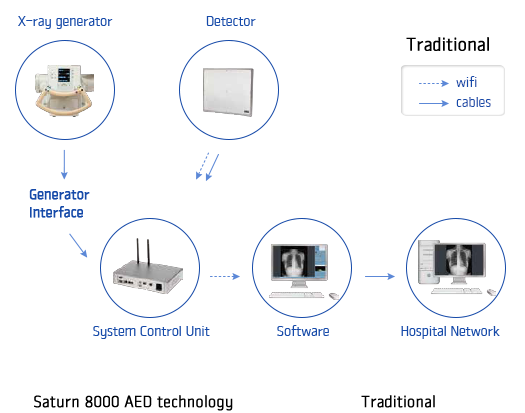 As the detector is not physically interfaced with the generator, it can be easily carried to different radiology rooms, ER room, Mobile Chest Screening, Sports and Military field imaging etc. 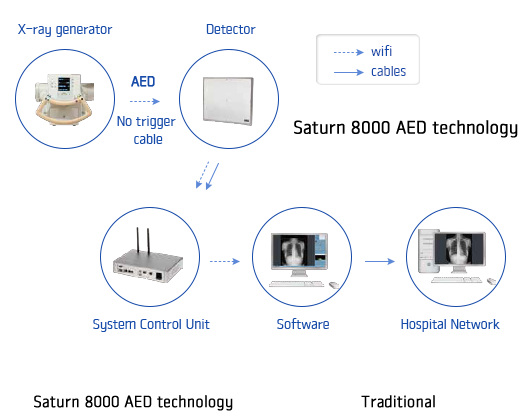 Portable mode is a very powerful tool, enabling direct communication with any mobile device, to take the X-Rays and store up to 100 images on the on-board memory, particularly useful in patient wards. is all what you need to take X-Rays. for effective protection during sliding the detector into the bucky. and strength for greater patient weight during table top examinations.